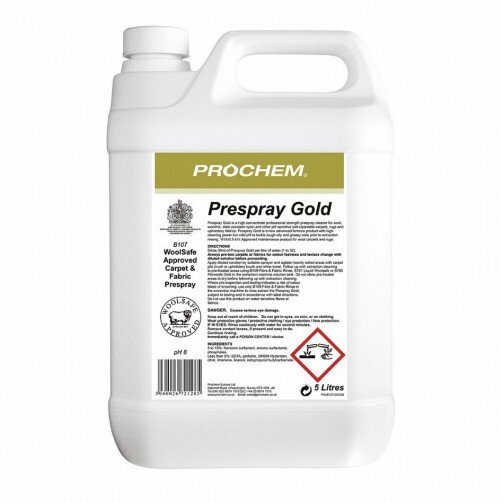 Prespray Gold is a high concentrate professional strength prespray cleaner for wool, wool mix, stain resistant nylon and other pH sensitive wet-cleanable carpets, rugs and upholstery fabrics. 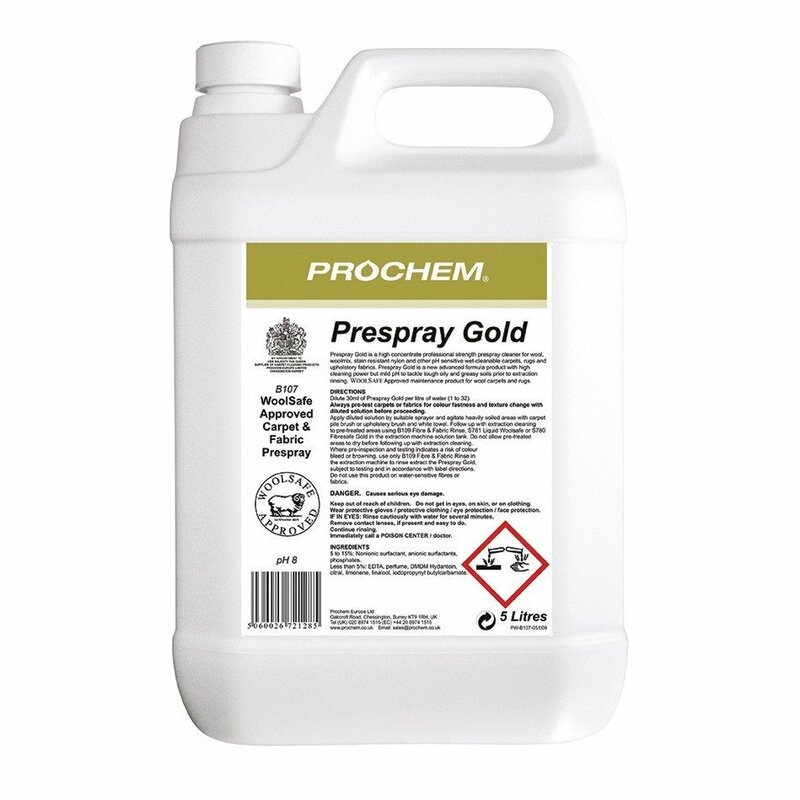 Prespray Gold is an advanced formula product with high cleaning power but mild pH to tackle tough oily and greasy soils prior to extraction rinsing. WoolSafe Approved maintenance product for wool carpets and rugs. For professional and industrial use only. Do not allow product to freeze. Mix 30ml of Prespray Gold per litre of water (1 to 32). Always pre-test carpets or fabrics for colour fastness and texture change with diluted solution before proceeding. Apply diluted solution by suitable sprayer and agitate heavily soiled areas with carpet pile brush or upholstery brush and white towel. Follow up with extraction cleaning to pre-treated areas using B109 Fibre & Fabric Rinse, S781 Liquid Woolsafe or B106 Extraclean in the extraction machine solution tank. Do not allow pre-treated areas to dry before following up with extraction cleaning. Where pre-inspection and testing indicates a risk of colour bleed or browning, use only B109 Fibre & Fabric Rinse in the extraction machine to rinse extract the Prespray Gold, subject to testing and in accordance with label directions. Do not use this product on water-sensitive fibres or fabrics.